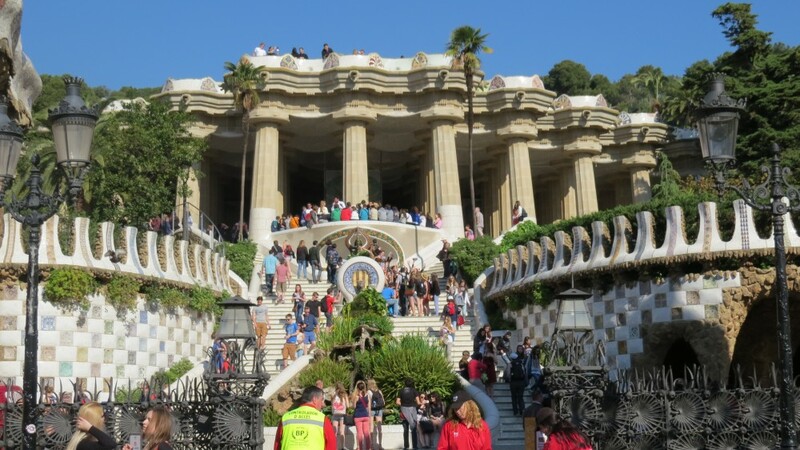 I first visited Park Guell, designed by the Catalan architect Antoni Gaudi in the last dark days of Franco’s rule, before a resurgent Catalonia and before Barcelona had become a hip tourist destination. Then the park was a sleepy and sad run-down place used mainly by dog-walkers, many of its bizarre structures roped off and scaffolded because of their poor state of repair. I had become familiar with the works of Gaudi following a major retrospective at the Museum of Modern Art in New York in 1976. His remarkable buildings and park were rediscovered and popularised, and became part of the rebranding of Barcelona (then a declining industrial city) into one of Europe’s major tourist destinations. 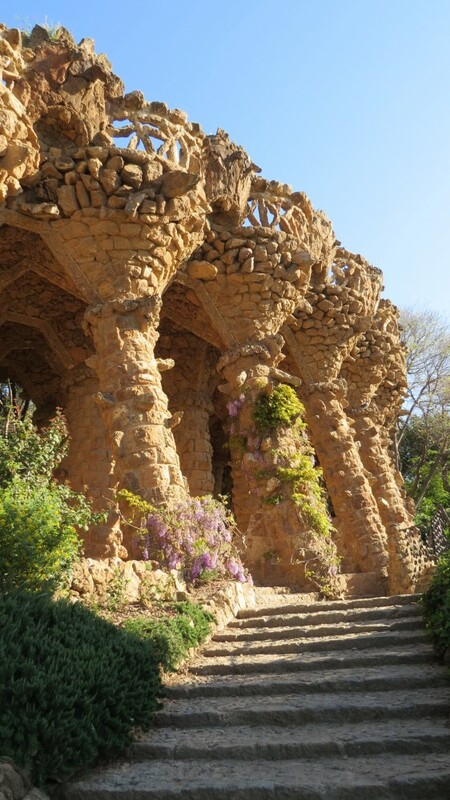 Born in 1876, from an early age Gaudi was fascinated by nature and architecture. As he grew older these two passions merged, and he made detailed studies of the organic structures of plants and mammals; how stems and branches supported leaves and how a ribcage could form an efficient structure for a mammal. This is the key to understanding the amazing buildings of Gaudi, and the structures of Park Guell. His client, Eusebio Guell, was one of Barcelona’s foremost industrialists and much influenced by the Garden City Movement. 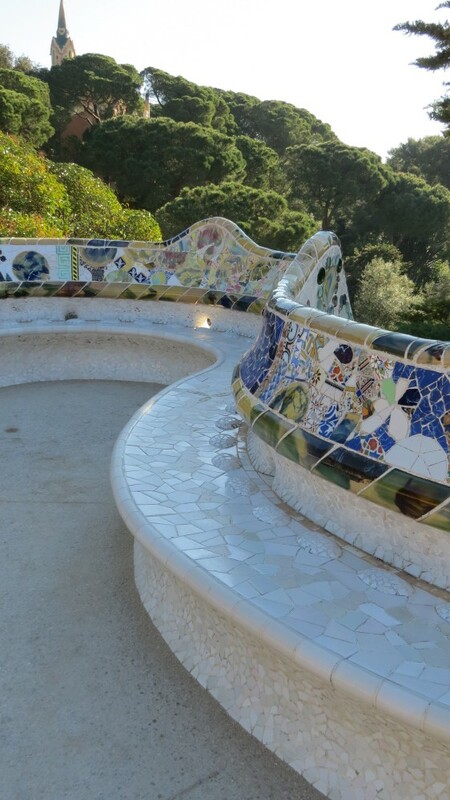 He conceived what was later to be called Park Guell as a speculative gated community where wealthy Barcelona families could live close to nature and escape the dirt and smog of the city. 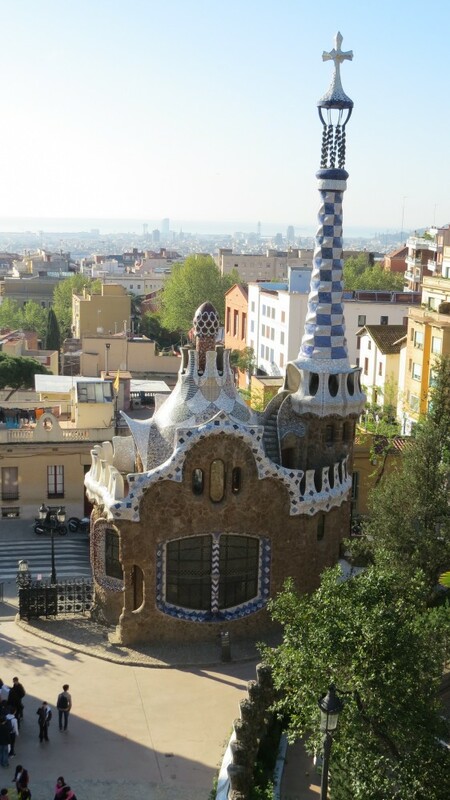 Guell asked his close friend Gaudi, who had worked for him previously to be the master planner and architect for the project, although individual houses were to be designed by other architects. At the entrance to the steeply-ascending park are the Hansel and Gretel-like gatehouse and office, with roofs like soft scoop ice cream. From here, I climbed the double stair enclosing the famous tiled lizard to the Hypostyle Hall supported on neo-Doric columns, many of them leaning drunkenly inwards. This was planned to be a market place and I have always thought it to be an over-elaborate solution. Above is an extensive esplanade intended for promenading and performances with its remarkable undulating broken tiled seating. Numerous colonnades, viaducts, and very substantial embankments were built to support a series of terraces. Roads snaked up through the site, and steps and footpaths took shortcuts between the different levels. 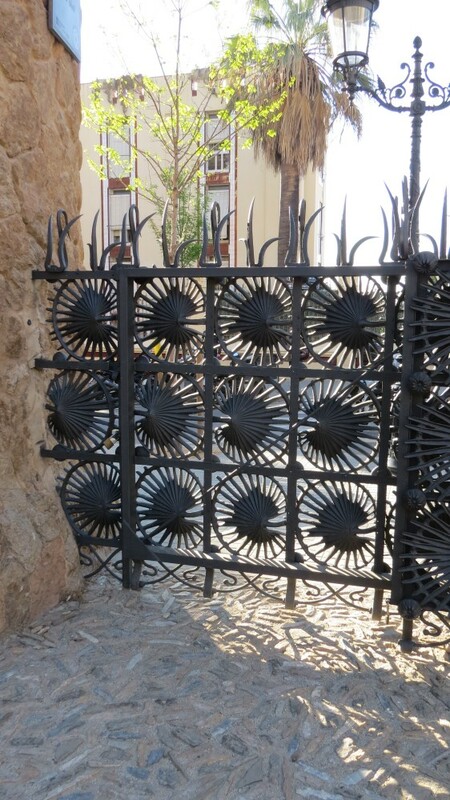 With this extraordinary infrastructure in place, Guell’s intention was to sell the 60 triangular parcels of land for development, but a reverse in the housing market led to only three sites being developed, one of which was Gaudi’s own house (now his museum), another the refurbishment of Guell’s existing mansion. The venture went bankrupt, but if it had succeeded it would have been a private fairly crowded gated residential development with a very different feel. I have always felt that the site was wrong for this project and that the cost of the infrastructure probably caused the plots to be over-priced. A further disadvantage was that it was not close to a metro stop or a tram line. Other speculative developments in Barcelona, built on flatter land that satisfied these criteria succeeded around the time Park Guell failed. 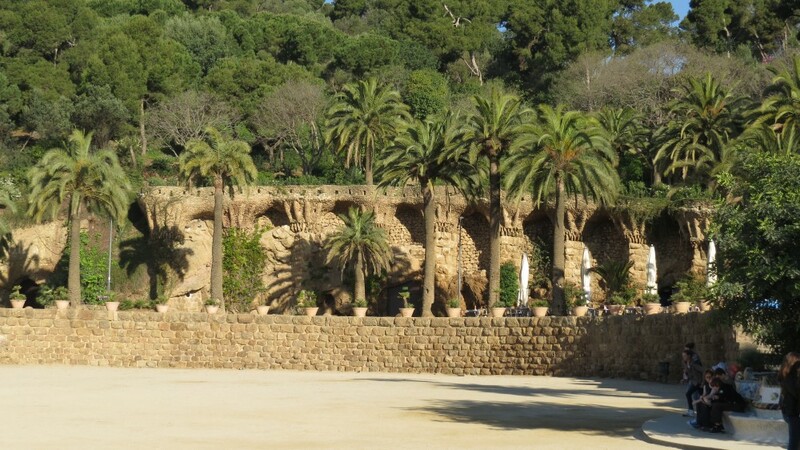 The site, originally known as Bare Mountain, was abandoned for several years but taken over by Barcelona City Council in the early 1920s, and after much tree-planting opened as a municipal park. Gaudi had never been popular outside his circle of clerics and wealthy industrialists, and was viewed by the public as ‘a madman with a sense of grandeur.’ The eventual victory of Franco in the Spanish Civil War led to the suppression of all things Catalan, and Gaudi although by then dead, became further discredited because he had been an ardent Catalan nationalist. 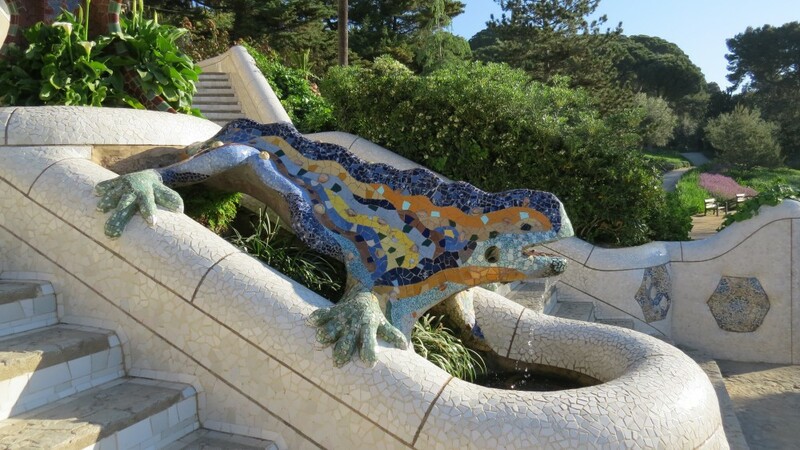 Today Park Guell, along with six of Gaudi’s buildings have been declared UNESCO World Heritage sites. Knowing it in a run-down state, it is a joy for me to see the masonry has been lovingly repaired, the amazing tile work and the beautiful wrought iron gates and railings carefully restored and stylish new boundary fences, handrails and landscaping details put in place. 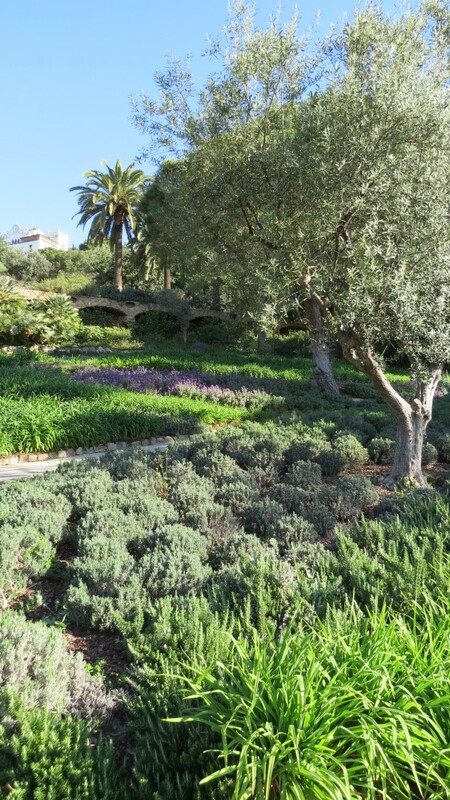 Great care has been taken by garden designer Anna Bernal in planting up the generous drifts of perennials and small shrubs to the beds and borders to counterbalance the strange structures. 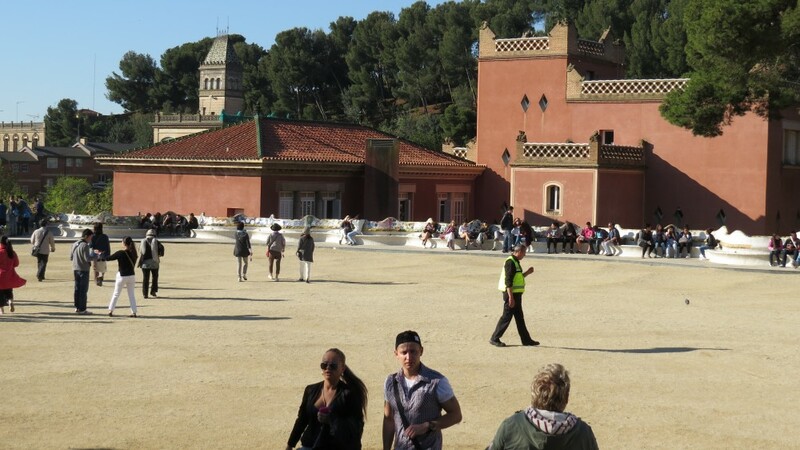 Intended as a garden city rather than the wonderful public park it has since become, Park Guell is a dream-like place of pilgrimage for the many thousands seeking the Gaudi Experience. Thankfully, it has come a long way since the grim days of Franco.